Fish have become favorites at our shows. 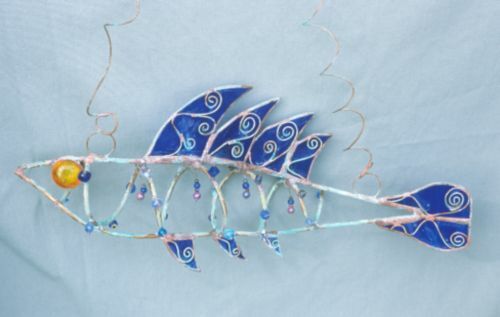 The fish above-left is made from copper tubing, stained glass fins, glass bead hangings from the top of the body and glass beads on the ribs. The eyes are made from the tops of recycled wine bottles. It is 3-dimensional. The fins are decorated with copper wire filigree. The copper has a green verdigris. Most fish are hung with a copper chain although I have used spiraled copper wire. Because each fish is unique, size will vary. They generally range from 14"-16" long, 8"-10" high and 4"-5" in depth. The fish above-right is 2 dimensional. It is made from copper wire, glass, glass gems, and shells filled with solder. The hanger is a spiral of copper wire. Most are approximately 12" in length and 8"-10" high. The fish that are pictured here are examples - they have been sold at recent shows. I can custom-make a fish for you in the colors and style that you prefer. Size can also vary and would adjust the price accordingly. Fish with glass beads (left examples) are $80 + S/H from $14 to $20. Fish with shells and glass gems are $51 + S/H from $14 to $20.